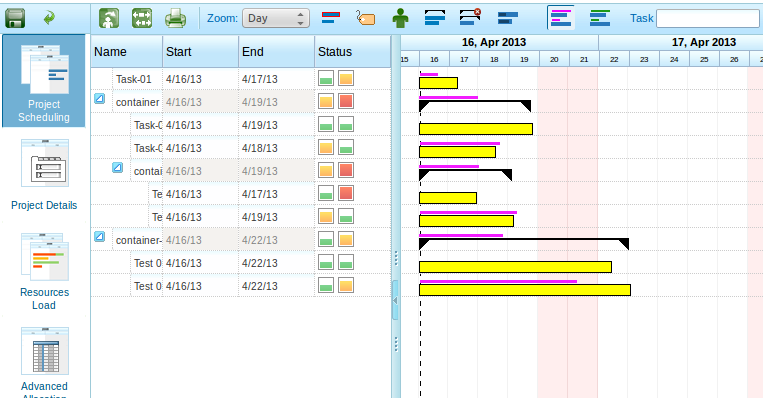 It’s been a while and Miciele has been very busy developing stuff for LibrePlan. Our latest development has to do with project margins. As a projectmanager you will probably want to know if a task in a project takes longer than expected because it is your job to act upon those kind of things. Well, now you can! 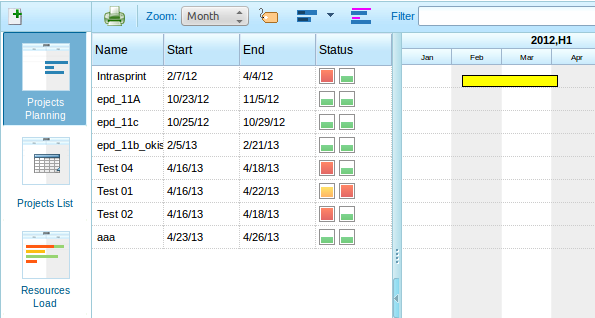 In the “general data” tab of a project is is possible to add margins on time and budget. For instance, you can say that you work with a 10% margin. As soon as a task takes longer than expected the indicator turns orange. As soon as the task takes more than 10% longer the indicator turns red. This way, you do not have to check all of your projects every day, you can only check the ones that need some attention. As you can see in the picture above, there are some projects that need attention. There is a new column and the left icon is for time, and the right column is voor money. Now, how does an open project look? Now when I open one of those projects like in the picture above, I can see the tasks that need attention, and I can even see the containers that have tasks that need attention. This makes it very easy to find tasks that need attention.